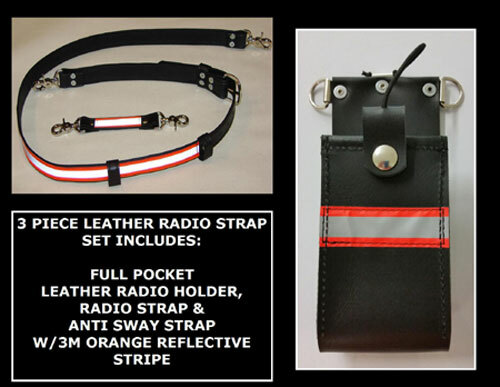 Leather FULL POCKET Radio Holder, Radio Strap, and Anti Sway strap. The radio case matches the straps with the 3M Orange Reflective Trim sewn across the front. A Sav-A-Jake exclusive design! The entire set is HANDCRAFTED of fine quality leather. Our leather products are NOT mass produced, unlike other well known leather product brands. Our Full Pocket Motorola/Universal Radio Holder has a strap that secures the radio at the top to keep it from shifting upward during vigorous motion. Metal D-rings are secured to the holder for attachment to any radio strap. and many more compact sized radios in the industry! Our custom cut radio straps are 1.25" wide and have TWO mic loops to hold your microphone and an adjustable belt for a comfortable custom fit. FOUR lengths to choose from: SHORT length fits firefighters under 5'8" tall and adjusts from 47 to 54 inches in length. Our standard length fits most firefighters up to 6'1" tall. The strap adjusts from 51 1/2" to 62 1/2" in length. The XL length radio strap fits firefighters from 6'1" - 6'6" tall and adjusts from 62-69 inches. This length is ideal for a "big and tall" sized person. Our XXL length strap is for persons over 6'6" tall and adjusts from 67-75 inches. Made from full grain leather - the strongest and most durable grade available. The anti sway strap has heavy duty swivel snaps are rivet mounted to both ends. The strap will keep your radio case from swaying at the hip. By simply attaching one end of the Anti-Sway Radio Stabilizer Strap to your radio case and the other end to your uniform pants or bunker pants belt loop, you will keep your radio close and secure on your hip. 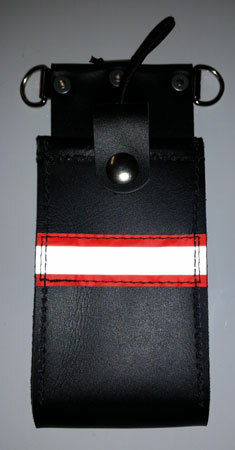 Leather Firefighter 1.5 inch wide Radio Strap & Holder Set "The Thin Red Line"
Subscribe to our newsletter for new product updates and promotions! We respect your privacy - your information will NOT be sold or distributed to ANYONE. Copyright SAV-A-JAKE INTERNATIONAL. All Rights Reserved. eCommerce Software by 3dcart.